Physical discs are being printed for shipping now. One reason for waiting was so we could get the 1.04 patch as the base build on the disc. You should start seeing your discs in the next few weeks. To make sure that your latest shipping information is on record, please go to the Backer Portal and update your address by Monday, May 11th. We have received the final cut of the Pillars of Eternity documentary and are going through it now. Shortly, we will be able to give an exclusive sneak peek of the documentary to our backers before the general public gets to see it. Be on the look out for an update about it in the next week or two. Note: We performed some changes to the game's Steam depots yesterday. Most of you shouldn't notice any difference, but some individuals that may have had non-standard game install locations were seeing some strange behavior where the PillarsofEternity_Data folder in the root of their game directory was getting renamed to EmptySteamDepot. If you rename that folder back to PillarsofEternity_Data, it should resolve the issue. If renaming the folder doesn't work, try performing the Verify Integrity of Game Cache option in Steam to fix the problem. You can do this by right-clicking on the Pillars of Eternity game in your Library, clicking on Properties, clicking on the Local Files tab, and clicking the button that reads Verify Integrity of Game Cache. This will repair any missing or damaged files so you can play the game again. Head to this thread on our forums for more information about the process. Reblanced XP rewards of some quests, particularly the bounty quests, to prevent parties from hitting max level before Twin Elms. Ciphers now start with 1/4 max Focus instead of 1/2. Wizard and Cipher's base endurance has been raised from 30 to 36, and per level from 10 to 12. Wizard and Priests health multipliers were raised from 3 to 4. Interdiction range has been reduced from 20 to 10. Tuned down damage on the Retaliation mod. Citzal's Spirit Lance will now do 50% more damage, is faster, and has an increased AoE. Sanguine Plate's Retaliate mod has been replaced with Spell Holding: Frenzy. Wind Blight's Returning Storm is now set to 1/encounter. Earth Blight's Teleport ability is now set to 2/encounter. Sturdy bonus is improved from +20 to +30 vs Prone. Hand and Key's Preservation has been replaced with Loyal. Aru Breaker's Preservation has been replaced with a +1 Speed. Angio's Gambeson's Reflex bonus is replaced with 1/day Deleterious Alacrity of Motion. Rebel's Call Preservation has been replaced with Wary. Lightning Strikes damage is increased by 25%. Fan of Flames damage is reduced by 25%. Minor Arcane Reflection base duration is changed to 60 seconds. Llengrath's Displaced Image gives 50% hit to graze conversion on Deflection and Reflex. Wizard's Double now grants +40 Deflection against a single attack. Mirrored Images now grants a base +30 Deflection. It decreases by 5 after each hit. Ilengrath's Safeguard's bonuses are now unified. Crucible of the Soul, Speaker to the Restless, and Steps to the Wheel ranges have been increased. Arcane Veil now grants +50 Deflection, with Hardened Veil adding +25, for a total of +75 Deflection. Scroll of Paralysis is now slightly weaker and has a higher skill requirement. All Spell Holdings are 2/encounter. Soul Shock radius reduced from 2.5 to 1.25. Blizzard damage reduced significantly and attack speed increased to from 0.2 to 0.8. Overwhelming Wave now uses a range of 30-40 and stun duration lowered from 10s to 8s. Noxious Burst trap damage now is in line with other player trap damage. Reduced the accuracy on higher level player traps. Unbroken is now a per encounter ability. Ghost Blades set to foe only. Death Ring damage slightly raised, made foe only. Ninagauth's Freezing Pillar switched over to foe only. Concelhaut's Corrosive Siphon set to foe only. Stag's Horn damaged lowered. Reflex and Deflection penalties cut in half, and reduced duration from 15 to 10. Bracers of Spiritual Power and Archer's Gloves reduced damage from +20% to +10%. Scroll of Revival AoE reduced, range slightly reduced, and restored endurance halved. Marked Prey and Sworn Enemy have been set to 0 recovery actions, so they can be used and the Ranger/Paladin can immediately act again. Winter Wind has had its damage, range, and push decreased. Base interrupt has been increased. Vile Thorns has had its damage increased and range decreased. Petrified has had its damage bonus reduced from x4 to x2. Battle-forged status effect now ends when combat ends. This should prevent it from stacking because of save/load. Fix for Elusive Quarry so its status effects now end when combat ends. This should prevent it from stacking because of save/load. 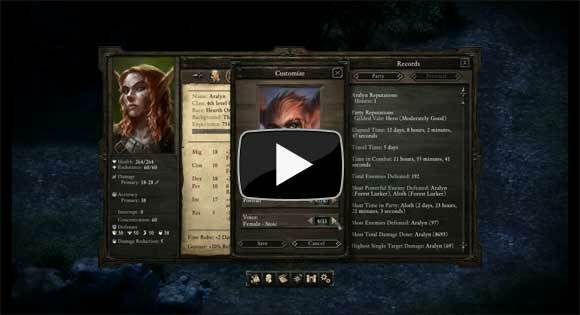 Many spells and abilities will have more accurate and updated stat blocks and improved output in the combat log, tooltips, and character sheet. Modal abilities now have activation and deactivation timers. Fixed an issue where some AOE attacks were not displaying the extra Intellect bonus properly. Added new effect when petrified. Traps can now be passively detected at -4 Mechanics. Added an animation to the Fox and the Hunter ability and removed the damage effect. Second Chance will no longer trigger the defeat screen if the entire party goes down right before the effect fires. Fixed display of the cast UI for Seven Nights She Waited While the White Winds Wept. Tuning Wheel's effect is not hostile anymore. Painful Interdiction is now correctly marked as hostile. Escape should now always prevent disengagement attacks. Seven Nights She Waited While the White Winds Wept will no longer attack allies. Barbarian Threatening Presence will no longer spam the combat log when the Barbarian loses all endurance. NPC Chanters will now resume chanting once they use their invocations. Getting maimed will not clear fatigue. All wall spells should now disappear when combat ends. New Glossary entries for spellbind, spell holding, and spell striking. Switched the ingredients for Freezing and Shocking lashes. Druid's Wildstrike Belt is now working as intended. Marked Prey is now working at intended. Draining Whip is now working as intended. One Stands Alone is now working as intended. Interrupting Blows is now working as intended, and will correctly increase interrupt. Mortification of the Soul is now working as intended, and should only award 1 wound. Scion of Flame, Spirit of Decay, Secrets of the Rime and Heart of the Storm should now correctly increase damage of all abilities. Driving Flight will now work properly with Blunderbuss type guns. The Retaliate mod should not strike allies after using Field Triage. Pet fatigue has been removed. Wild Leech is now combat only and the Leech effect will last until combat ends. This fixes issues with it not working with save/load correctly. Fix to Total Max Focus stat that would reset to the base value if you had the Greater Focus talent after a save/load. This is a retroactive fix that will restore your Cipher with an extra +10 focus if you have the talent. Party member stats on the character sheet will now show properly if the companion is removed and re-added from the stronghold. Fixed issues where companions could lose their items when assigned to the stronghold. Grieving Mother's Perception and Intellect scores have been switched. The Man Who Waits: The citizens of the Sanitarium will no longer become hostile if you kill and loot Azo after the Sanitarium riot and then fight flesh golems. Fix is retroactive. Fixed issue with a reputation loss with Gilded Vale when entering Raedric's Hold. Removed disposition exploit with the Records Keeper. A few encounter placement changes. Fixed issues with stronghold hirelings becoming hostile. Retroactive fix to update Sanitarium quest stage to proper state if you already talked to Ethelmoer and then asked for Sanitarium directions from a city guard. Added retroactive fix if you've advanced Heritage Hill quest to Icantha but then asked a city guard for directions to Heritage Hill. Fixed a number of issues with the Winds of Steel quest. This should be a retroactive fix if the quest was already started before working on the second quest with the Dozens or Doemenels, or if the quest was acquired or completed in conjunction with Bronze Beneath the Lake or Changing of the Guard. Attacking any of the main three Defiance Bay factions after having secured their invitation to the hearing will now make Lady Webb give you an invite in the name of Dunryd Row. Fixed issues with the Hermit of Hadret House quest. If Sul or Oernos were defeated before speaking to Desthwn for the first time then The Old Queen and the New King quest will not revert to an earlier quest stage. Hendyna's conversation is fixed up to be properly linked together. Fixed a case where one of Clyver's responses would not appear in conversation if you ask him twice about the hearing. Killing Alwah while she appears in Oldsong now prevents her from appearing alive in Galawain's Maw when you turn in the Prison of Ice quest. Fixed an issue where the Hall of Revealed Mysteries would turn hostile after opening the door to the Elder Archives and then re-loading into the scene (while not in stealth). Changed the display of most stat multipliers to be percentage based. Added Shift as a default control for multi-selection, in addition to Ctrl. Improved the output in the Bestiary and added beast abilities. Portraits now turn grey if Stamina is being capped by Health or Fatigue. Stronghold adventures will now show the duration before you embark. Added apply button to resolution options screen. Default stealth key on Linux is now Ctrl. Weapon set buttons are now disabled when Spirit Shifted. Fixed several issues with containers and mouse cursor state on hover. Fixed an issue where the Lore requirement on scrolls was always displaying as red text. Fixed an issue where weapon sets were not visually unlocking. HUD does not upscale until 1920x1200. Fixed attack roll formula tooltips so they should now be readable in lower screen resolutions. Expert mode is now hidden on the main menu to avoid confusion about it not being selectable outside of a game. Changed slider bars so that they can slide the entire length of the options menu. Changed the order of the option buttons to make them more user-friendly. Tooltips now include sell price where appropriate. Chanter inspection UI should now display the correct durations. Armors should now correctly display DR in the inspection UI. Adjusted position of the Concentration skill in the Character Sheet. Cleaned up problems with improper ability icons showing if you switch party members with hotkeys. Improved loading screen scaling for resolutions greater than 1920 x 1080. Corrected a tooltip string on the voice volume slider. Fixed issues with tooltips being obscured in the inventory screen. Removed exploit of being able to transition into a new area with a dead player character. Sorry speed runners. I'm pretty happy with a number of these changes, particularly improvements to the stash and the inverted stronghold log. Still haven't seen a fix for the Lighthouse door blocking issues though. Hi BAdler, thanks for update and patch! But there is no hint when we do get the NOVELLA!? What do you think? I've heard somewhere that CA has not even finished the WL2 novella? When do we get the novella? I would appreciate an answer to this. I guess its just a minor thing but after seeing the changes in 1.05, I wish that one made it to the disc version instead of 1.04. Thanks for all your hard work and dedication, devs! Chris is currently working on the novella. When we have more information about it, we will send it out in a backer update. He should simply write faster. Does this mean that I fine have to go through 3 load screens to rest at my stronghold? If so I'm a happy camper. Nice to see every way covered. And lmao at the bug exploit by speedrunners, I'll always be amazed at how they found those things. Also, on Linux I could never see capes on characters; but on Windows, I can. What could the reason be? Here is the updated bug list for the current build. Dear devs and communities, since there are a lot of fixes recently and some are not documented fully. Please let me know if a bug is actually fixed and I can amend the post accordingly. 1. Charmed enemies keep party buffs after charm expires and related bugs. 2. Sound cutting from companion dialogue. one; two; three; four; five. 3. Defenses and afflictions don't stack properly bug. one; two; three; four; five; six; seven; eight. 5. Monk transcendent suffering bugs (various issues, perhaps interrelated). one; two; three; four; five; six. 6. Duel wield and unarmed bugs (various issues, perhaps interrelated). 7. Retaliation procing on friendly spells/abilities bug. 9. Paladin auras continue to sometimes not display properly or not apply to allies. one; two; three; four; five; six; seven. one; two; thee; four; five; six; seven; eight. 13. Inventory items disappearing. Still an issue. There are also various ques bugs littered through the forum. I am not sure what ones are fixed or not. Please post any COMMON and RECURRING bugs in this thread, i.e bugs that you and OTHER people are experiencing. Edited by Baladas, 10 May 2015 - 05:24 AM. Very nice. Thank you all at Obsidian for all your hard work. I've been holding off on playing, mainly because I just haven't had any free time lately but it looks like now's a perfect time to start again. :D Really love the game. Exactly. It doesn't make a lick of sense. They delay the shipping of the CD version UNTIL AFTER 1.05 is released, but the base game is 1.04!? Do you mean "Leaving a game"? Previously you couldn't load a game at all during Trial of Iron; you could only quit. In other words, does this prevent players from quitting (via Exit or Alt+F4) and then reloading their game, by saving the game when they do that?